I have not been this excited for Christmas in years. It took all my self-control to not burst into Christmas carols before Thanksgiving (don’t worry, I didn’t – I have standards, after all). Today is the first day of Advent, a time of preparation for our Lord to come to us on Christmas day. Day one of my preparation involved putting my little tree up in my bedroom and decorating it with my favorite Christmas ornaments (a T.A.R.D.I.S., Rapunzel, Mickey Mouse as the Sorcerer’s Apprentice, Mickey Mouse as the Brave Little Tailor, Max from the Grinch, and many others). So, that’s my challenge for you. Help someone this holiday. Welcome Christmas by being friendly to everyone, even the people you don’t like, which is my least favorite thing to do. After all, there’s so much hate in this world, so let’s make our corner of the universe just a little brighter. Different things hold importance to me at different times of my life. Sometimes the things I love fluctuate in phases, just like the moon. But when I love something either the moon is full or you can’t see it at all. There is no half or crescent moon. To quote the false Isabella Thorpe in Jane Austen’s Northanger Abbey, “I have no notion of loving people by halves, it is not my nature.” When I fall in love, I fall in love. Ever since I moved back to the Pittsburgh area, I’ve been asking myself this same question over and over. Where are you? What is important to you? What do you hope to take with you wherever you go? And, the big question, where are you now? Physically, I am in Pittsburgh. But they say that home is where the heart is, and mine is always with the friends I left behind in Ohio, even if they are no longer living in Ohio. Once I warmed up to the idea of living in a state that everyone back home criticized, there was no going back. Now I can’t imagine not living in Ohio. December marks one year until my planned graduation date for my Master’s degree. So, very possibly, I only have one more year left in Pittsburgh. My heart is here, there, and everywhere. And that’s okay. If reading Harry Potter taught me anything, it’s that love is one of the most powerful forces in this universe. I am physically and mentally exhausted. Grad school is in full-swing, and writing this blog post is just a way to procrastinate from writing about information. It’s weird being a grad student in my parents’ kitchen versus sitting in a classroom discussing the topic of information with my peers. Somehow online discussion groups just don’t compare. Oh, online classes. But I digress. When I left Kent, I believed I was leaving my home. And at the time I was. I was leaving behind my friends who made life worth living and who made me better understand myself as a person. Now, I only still consistently talk to a handful of those people. Now I have a new life in Pittsburgh, with new friends, a new church, and a new perspective. But I still feel like a fish out of water. I always joked in college that you can take the girl out of Pittsburgh, but you can’t take the Pittsburgh out of the girl. Now I wonder if there was ever any Pittsburgh in me to begin with. If there was even any Ohio in me to begin with. I used to believe that there’s one place where we all belong and that we need to find that place. Now I’m not so sure. Since I’m still going to grad school through Kent State, that tie isn’t cut, but I’m living in Pittsburgh and wondering what I’m doing here. I wonder if I have a gypsy heart, where I’m not meant to stay in one place forever. 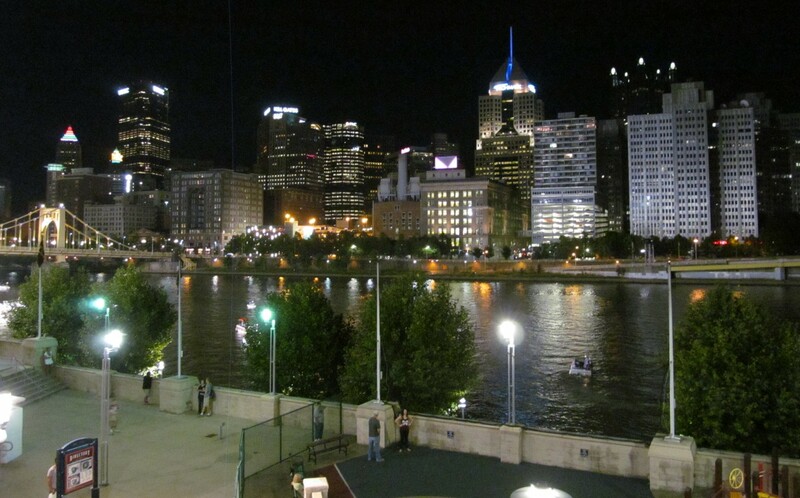 I left my heart in Ohio, but now it’s tied to Pittsburgh again. Still yet, a third of it wants to escape somewhere entirely new. This is an odd revelation. But I guess this is my eternal lesson in patience. Learning to appreciate where you are now, not always trying to jump ahead to where you will be. And right now, I have a discussion post to write. Whoops.